Defense Finance and Accounting Services (DFAS) provides payment services to the U.S. Department of Defense. Active duty and reserve members have the option to be paid once a month or twice a month. Most service members choose to be paid twice a month. If you select this option, the pay dates are the 15th of the month (the mid-month pay date) and the 1st of the following month (the end-of-month payday). 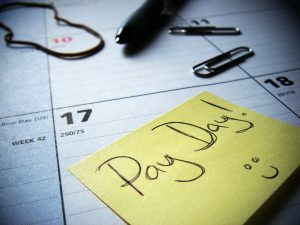 If the payday falls on a holiday or a weekend, you will be paid on the last business day before the 1st and the 15th. 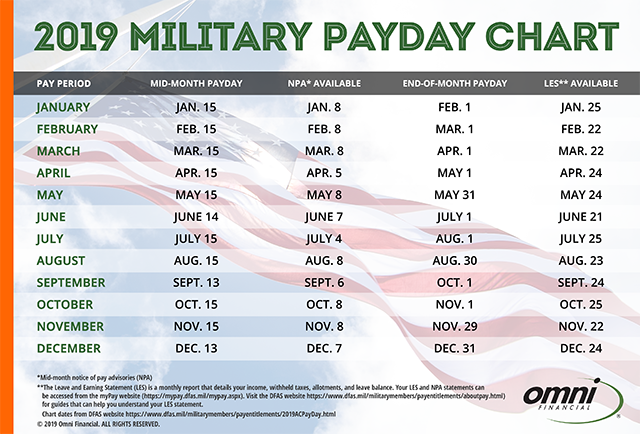 The 2019 military payday chart is here! Your bills seem to arrive in the mail every day, but you only get paid on the 1st and 15thof the month. Here are some tips that can help you stay on track with your payments. If it looks like you have money left over at the end of the month – good for you! Think of ways you can get the most value out of these funds like paying more than the minimum on your credit card or other loan, or transferring that money to a savings or retirement account. By paying your bills when you receive them, even if they are due later in the month, you avoid the temptation of spending money that should be allocated to these essential expenses. Pay your bills when you receive them, even if they are due later in the month. You’ll avoid the temptation of spending money that should be allocated to your essential expenses. Are you sometimes unable to cover some of your bills because the due dates don’t coincide with the dates you get paid? Consider switching the payment due date of some of your bills. Try changing the billing cycles of your credit cards, car loans, utility companies and insurance to dates that align better with your paydays. If you use autopay you may be able to change the date online. An emergency fund provides an important financial cushion just in case you run short on money between paychecks. Setting up an automatic savings plan is an easy way to build your savings. The premise is to pay yourself first, just as if you were your own bill. Read this Omni article for more information on how automatic savings plans work and the benefits of having one.